All Saints' Church, Northampton situated in the centre of Northampton, is a Parish Church of the Church of England and Northampton's Civic Church. After the fire, Charles II gave a thousand tons of timber for the rebuilding of All Hallows Church, and one tenth of the money collected for the rebuilding of the town was allocated to the rebuilding of All Hallows under the management of the King's Lynn architect, Henry Bell. 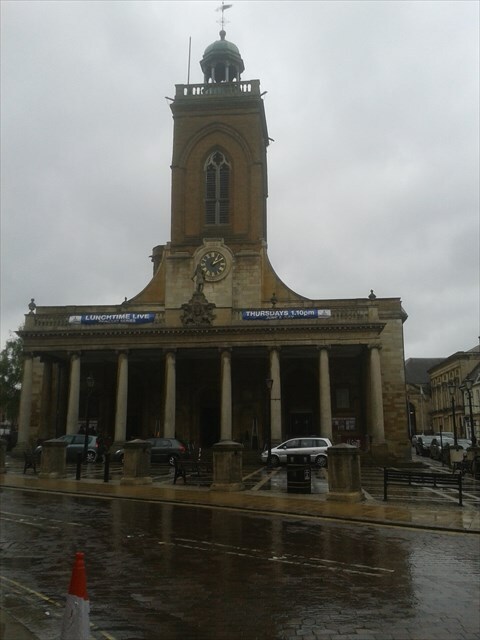 Henry Bell at the time was resident in Northampton, and he set to rebuild the church in a manner similar to Sir Christopher Wren's designs. After the fire, the central medieval tower had survived, as well as the crypt. The new church of All Saints was to be built east of the tower in an almost square plan, with a chancel to the east, and a north and south narthex flanking the tower. You enter the church through the existing tower into a barrel vaulted nave. At the centre there is a dome, supported on four Ionic columns, which is lit by a lantern above. The barrel vault extends into the aisles from the dome in a Greek-cross form, leaving four flat ceilings in the corners of the church. The church is well lit by plain glass windows in the aisles and originally there was a large east window in the chancel, that is now covered by a reredos. The plasterwork ceiling is finely decorated, and the barrel vaults are lit by elliptical windows.